It was approaching the late afternoon hours when our zestful guides from Macedonia Experience, Ljupco and Aleksandar, picked us up from central Skopje. We rode through a countryside composed of rolling verdant hills and dotted with cherry-red poppy flowers and the minarets of mosques. 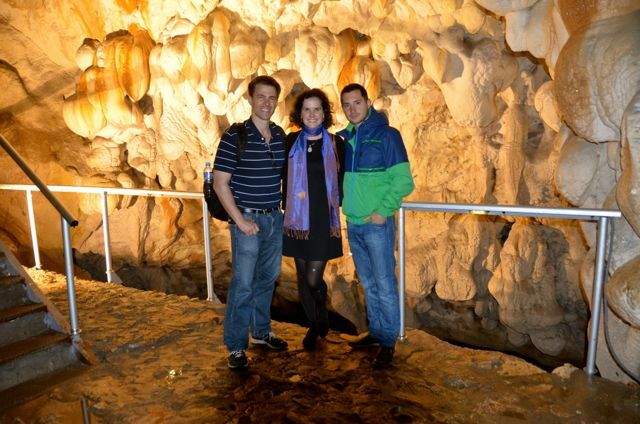 Having been hosted by Ljupco the night before at a wine tasting, we’d learned all about life in the Macedonian countryside, which apparently teems with homemade fig and walnut marmalade, lokum (similar to Turkish Delight treats), and baklava. 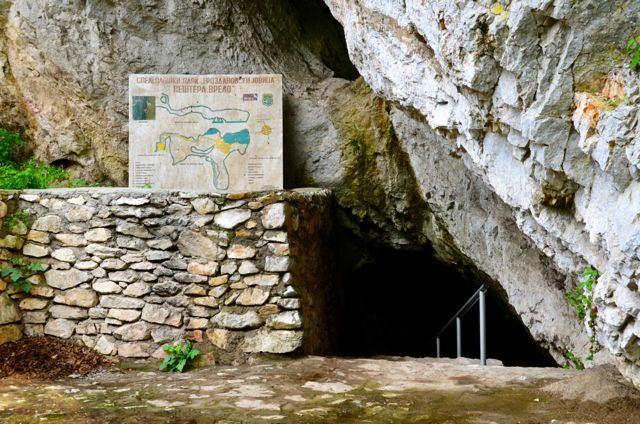 Ljupco explained that rural dwellers still often welcome guests with a dollop of marmalade and a glass of fresh spring water, a tradition that goes back centuries. 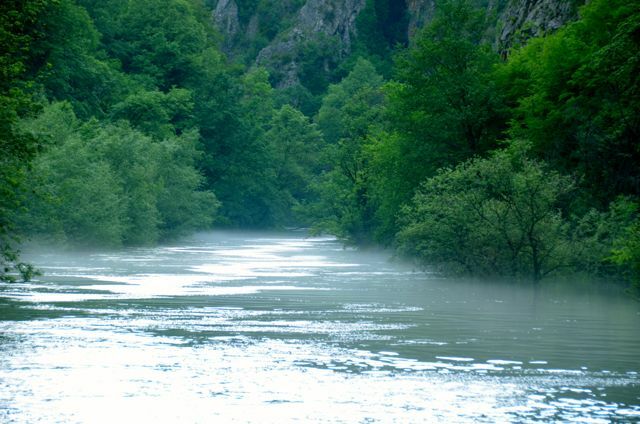 Given our short time in Skopje, and the stubborn cold I was battling, we wouldn’t be able to go on some of Macedonia Experience’s signature excursions – namely a 14-kilometer hiking trip from Skopje’s Millennium Cross to the Matka Canyon, a butterfly spotting walk, their active tours, or their ethnological excursions to meet villagers. 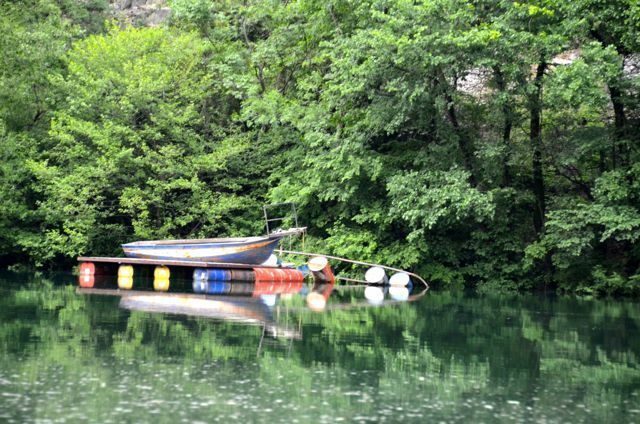 Nevertheless, we were eager to visit the Matka Canyon, a natural escape that’s so popular with Skopje residents, especially on weekends. 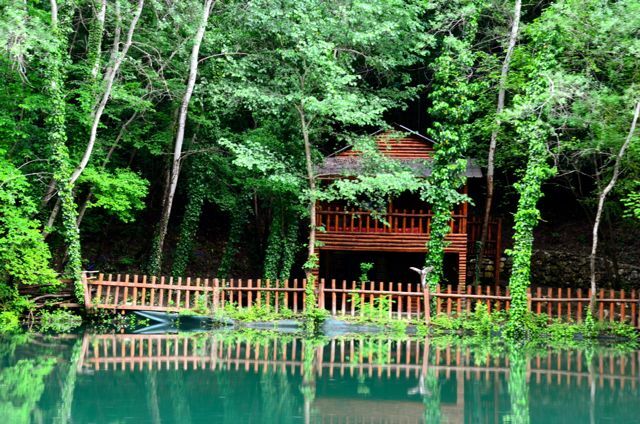 Swapping honking horns for a symphony of chirping birds, we arrived to our wooded retreat. 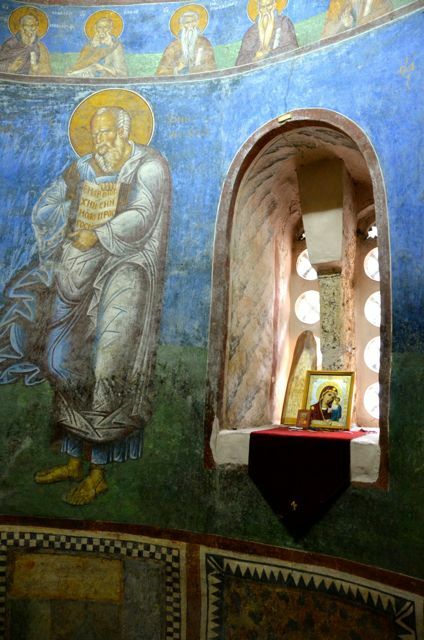 Shawn and I made a short stop into a tiny, centuries’ old Eastern Orthodox church, reminiscent of those we’d seen in Macedonia’s spiritual center of Ohrid. 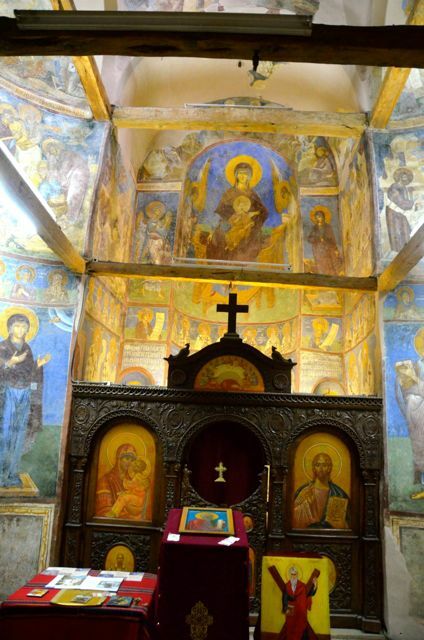 The brick structure’s interior walls were adorned with bold frescoes, which were darkened by the smoke of candles. We lit slender ones, placed them inside, and then joined Ljupco and Aleksandar outdoors. 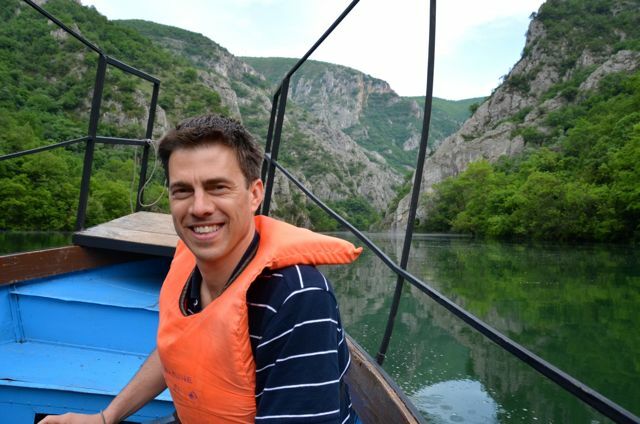 Hopping into a small boat near the church, we headed off to the Vrelo Cave, about three kilometers away. 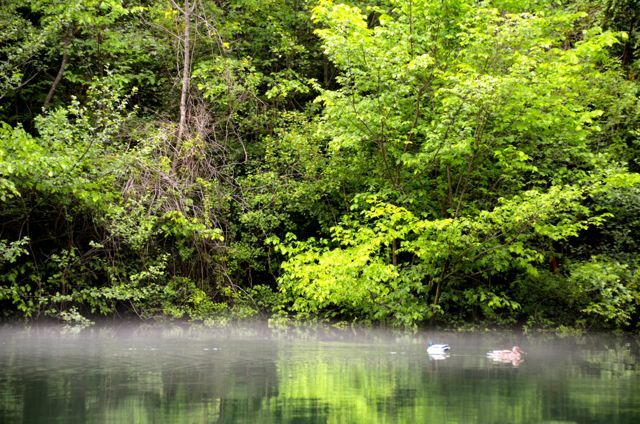 On the way, we passed a canoeing couple, rugged rocks on which some trees grew, and lush spring foliage. The air was cool and invigorating. We learned that matka means ‘womb’ in Macedonian. 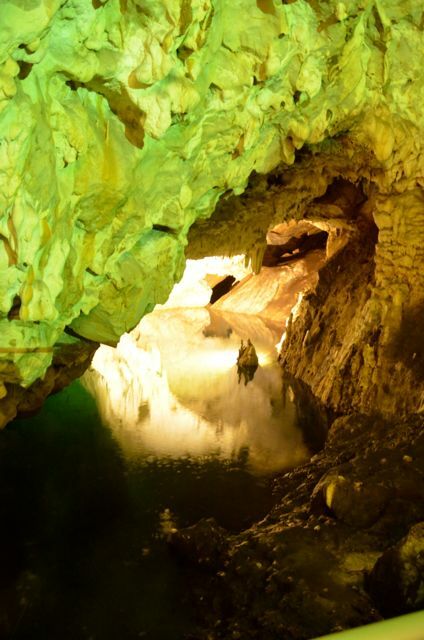 The cave, discovered in 1982, is 30 meters deep, and maintains an even temperature throughout the year. 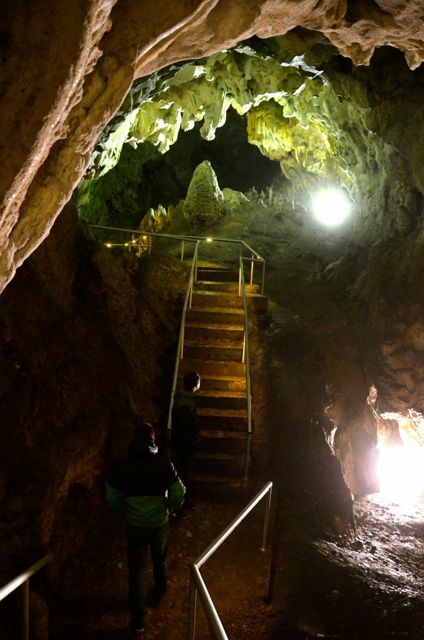 Inside, several bats awakened by the group of visitors flew overhead, while the rest of the colony slept among the stalactites. 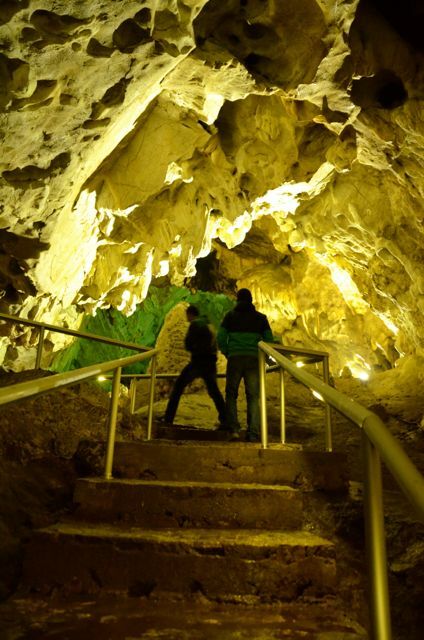 The acoustics are so good inside the cave that in 1995, a philharmonic performance was held there. I wonder how the bats responded to those vocalists’ crescendos? 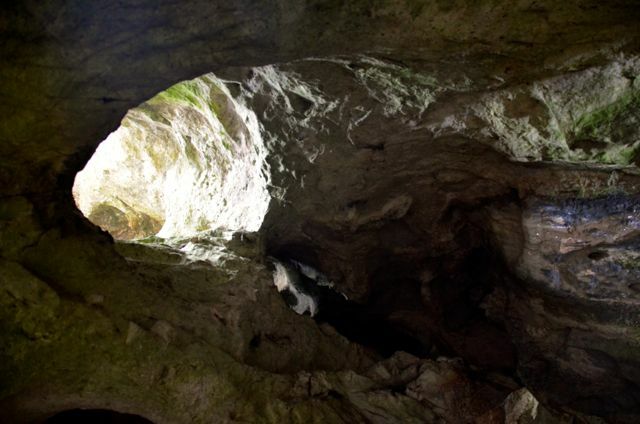 An underwater portion of the cave is attracting interest from scientists, some of whom think it’s the deepest in the world. 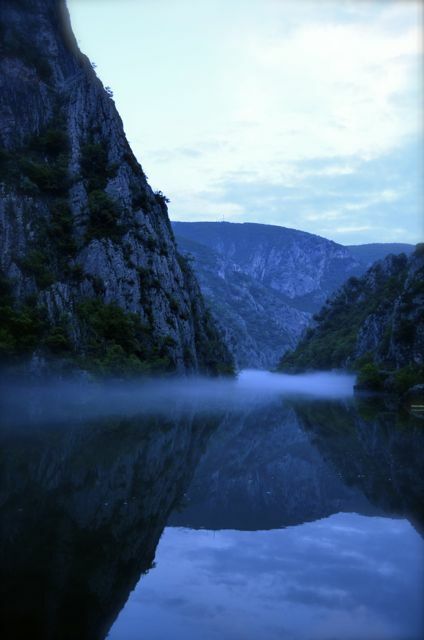 So far, it only holds the title of being the deepest in the Balkans, and the second deepest in Europe. 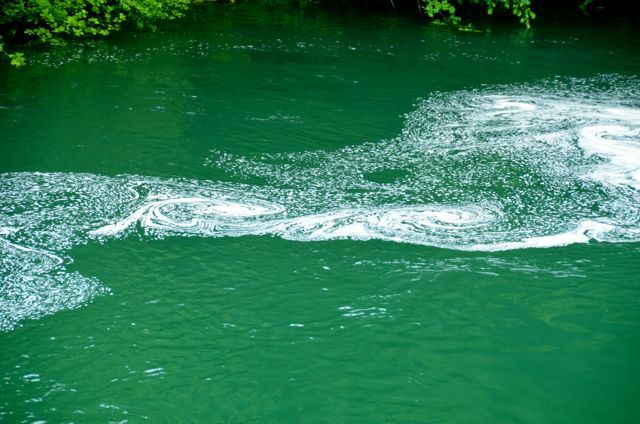 Its water exits into the river at the rate of 2,000 liters per second. As light was becoming increasingly scarce, we began our boat ride back to the canyon’s entrance, soon learning that our boat’s driver and trip hosts were not only skilled at entertaining visitors, but also rescuing them. 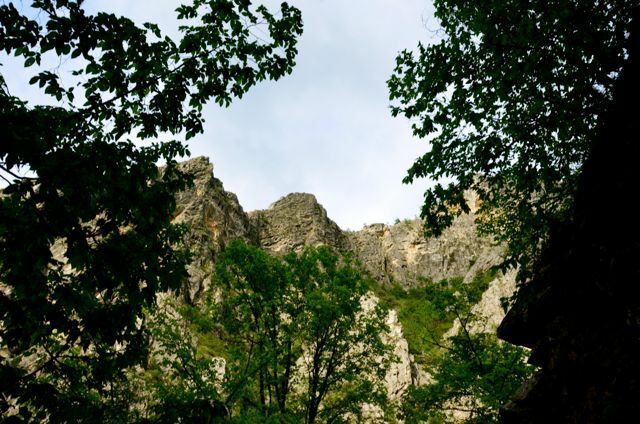 On one of the rugged rock formations, we saw the figure of a young man, gently waving at us. Our boat’s pilot approached the land’s edge, to hear the traveler shout out that he’d fallen a considerable distance from a path and that he needed help. Our new boating companion was a Japanese traveler on a ‘round the world adventure, who was visibly shaken, and mildly scratched, having been disoriented at the water’s edge for several hours. Shawn’s knowledge of Japanese came in handy, helping to comfort the traveler. We shuddered to think what would’ve happened if we had missed him. By now, the river had become still – almost glass-like, reflecting the rugged silhouette of the canyon’s rocks. Mist had descended throughout the valley, lending a mysterious air. Wanting to soak up our tranquil surroundings a bit more, we stopped at the restaurant situated on the water’s edge, chatting with Ljupco and Aleksandr over tea and coffee, before returning to the hustle and bustle of Skopje. 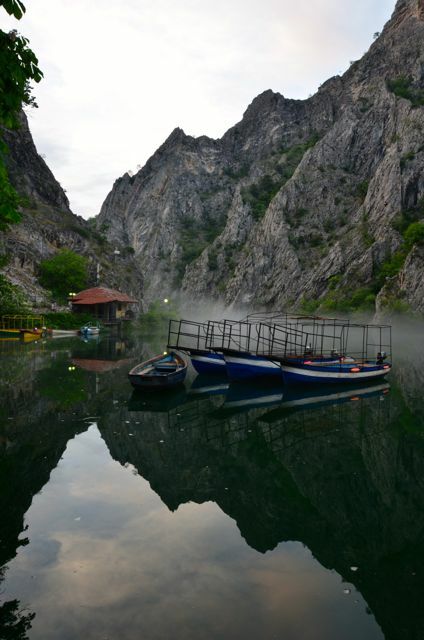 The Matka Canyon had been just the natural escape for which we’d been yearning! 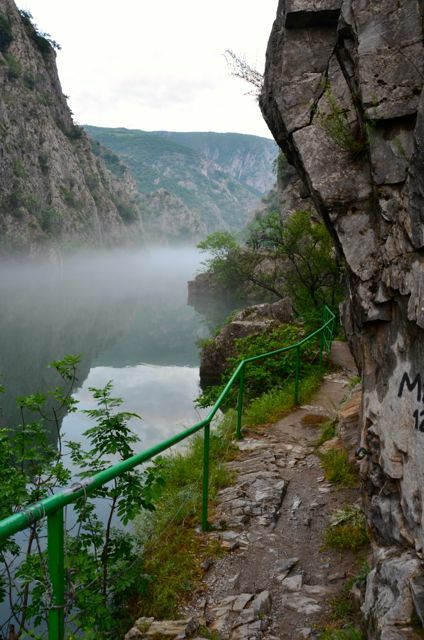 If you visit Matka Canyon, even if only by car, wear comfortable shoes, and stock a backpack with water and snacks. We also enjoyed stopping at the waterside restaurant as the sun began to set. It was the perfect spot to enjoy hot beverages on a chilly evening. As the encounter with the injured hiker taught us, it is indeed wise to have a guide along to navigate the rugged mountains. 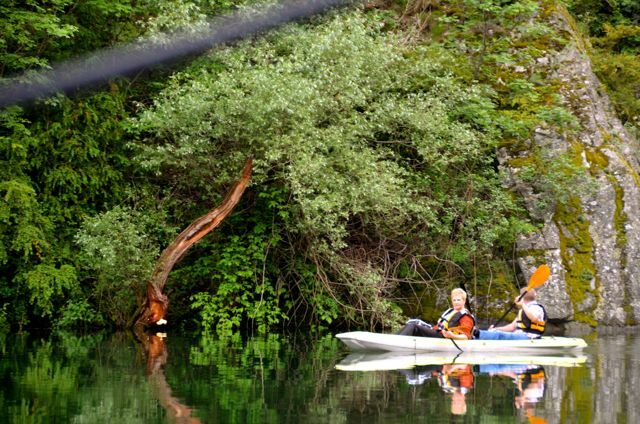 If you like customized, active tours (hiking, boating, kayaking) or cultural ones, consider touching base with the Macedonia Experience team. We respect their desire to promote sustainable, sensitive tourism, and enjoyed meeting a handful of the energetic professionals who established the small company. Need more inspiration? 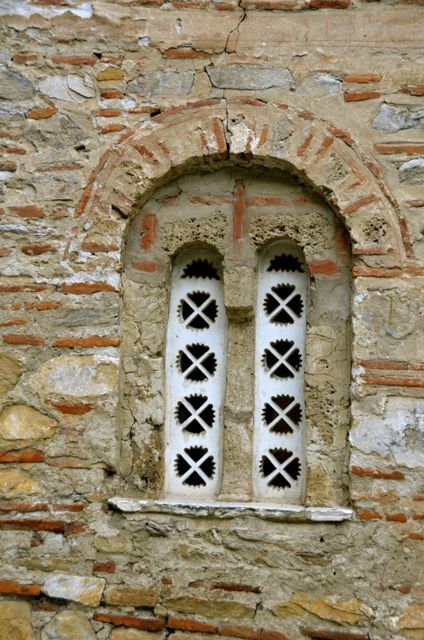 This link contains an index of all my posts from Macedonia. 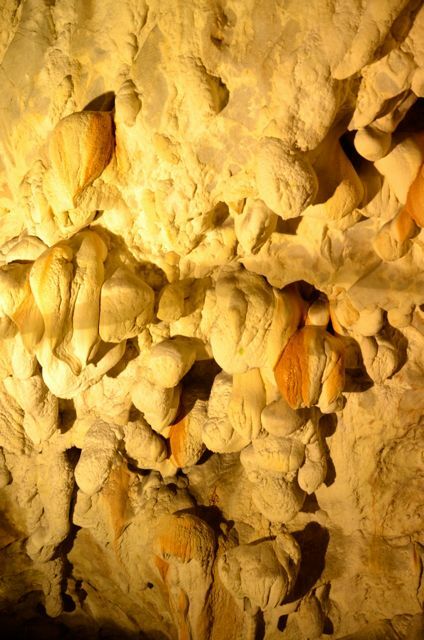 Macedonia Experience hosted us for this Matka Canyon excursion. 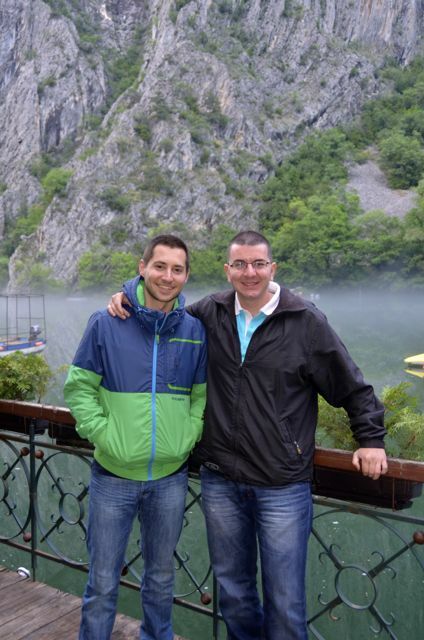 Благодарам / Many thanks Ljupco and Aleksandar for taking us on this refreshing day trip. The natural wonders and fresh mountain air were wonderful, as was your company, and the cultural and historical tidbits that you shared with us during the journey. Somewhere else that I haven’t been. It looks great Tricia. Super photos. Wow! Looks like an amazing location! Phil, it probably would’ve been just the kind of place that you like to shoot nature. 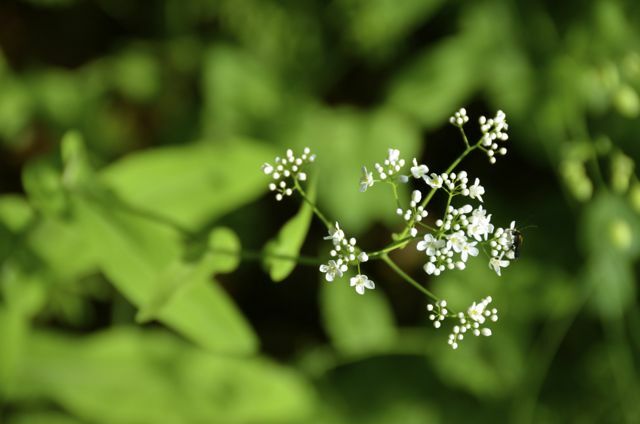 Next time, I hope we can do some full-day hikes there so that we can spot the butterflies and other critters that lurk in those beautiful mountains. Jo, I’m late to send well-wishes, but here’s hoping that you’re feeling much better and that you enjoyed the time with your daughter. Europe’s had such unusual spring weather this year, hasn’t it?! Guten Tag, Cornelia! We’ve just returned to Germany, and I’m wondering if you’re anywhere in the neighborhood? With the floods in this region, we had a bit of an interrupted return to Oberammergau via train, but today enjoyed much sunshine. Cornelia, thank you for the welcome back greetings. As they say, “let’s play it by ear” then. :) Enjoy Florence and the Tuscan countryside. When we were there a few years ago, we went to a wonderful olive plantation that made olive oil and even a lovely dessert wine. If I can recall the name, I’ll certainly share it with you. Until then, have a wonderful time! Indeed, Val! After the frenetic pace of Skopje, it was a pleasure being among nature. Those mountain/lake scenes are breathtaking.Beautiful description and location. They were, Lynne. 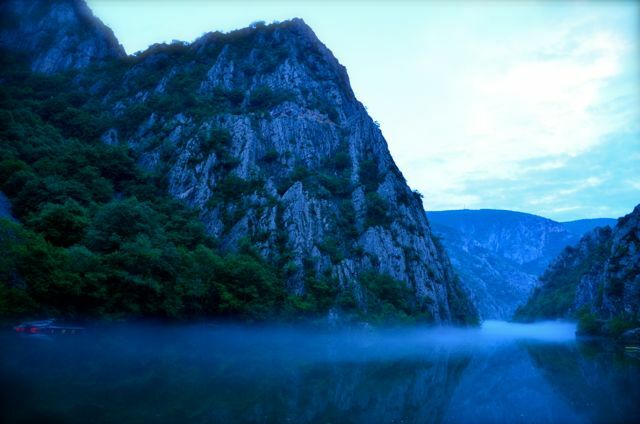 We were surprised that prior to going to Macedonia, we’d never heard of the Matka Canyon. Travel perpetually teaches how much there is to learn about the world. What an intriguing place to visit – glad you could escape the noisy city for a while and very happy for the Japanese traveler you lent a hand. We must give most credit to our boat’s pilot who expertly navigated the ship to shore. We did find it lucky that my husband was able to converse with the traveler in his native language too. Very nice Tricia, thanks for sharing. Terri, feeling better and now visiting my parents in Germany. Since we have consistent internet now (in France, we experienced the most challenging connectivity during most of our travels) I can’t wait to share more of our Balkans tales and catch up on yours too! On a side note, it’s fun that my husband is now in contact with the young Japanese traveler that our pilot rescued. The world is small, and I wouldn’t be surprised if our paths crossed again. The underwater portion and the images you captured although it was cold are so expressive. I am one among those who like to see glass like river with reflections of nearby scenery with those of current streams. I somehow felt like i was being taken to the time with you while reading it. Loved this excursion completely. Kudos ! I visted there on a very cold winter day in 2003. I spent the whole day hiking around and to a wonderful little monestary up on the hill above. It is a pretty incredible place. Nice to see your excellent photos from there! Jim, hiking is something we had hoped to do too, had I not been under the weather. 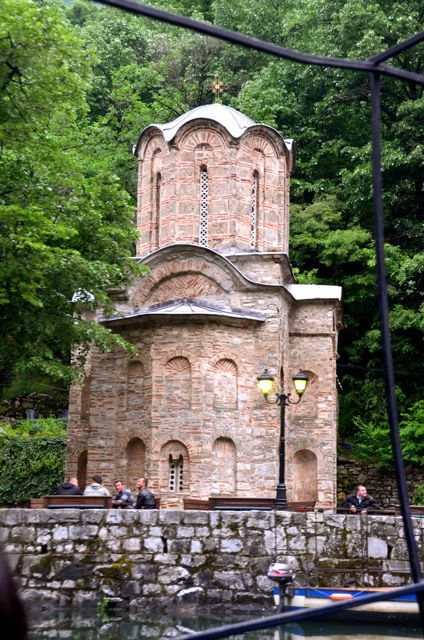 Our hosts mentioned that there was a lovely trek from Skopje to that little monastery. We hope that we might get back to Macedonia again soon so we can pick up where we left off. Did you visit other spots in the country?